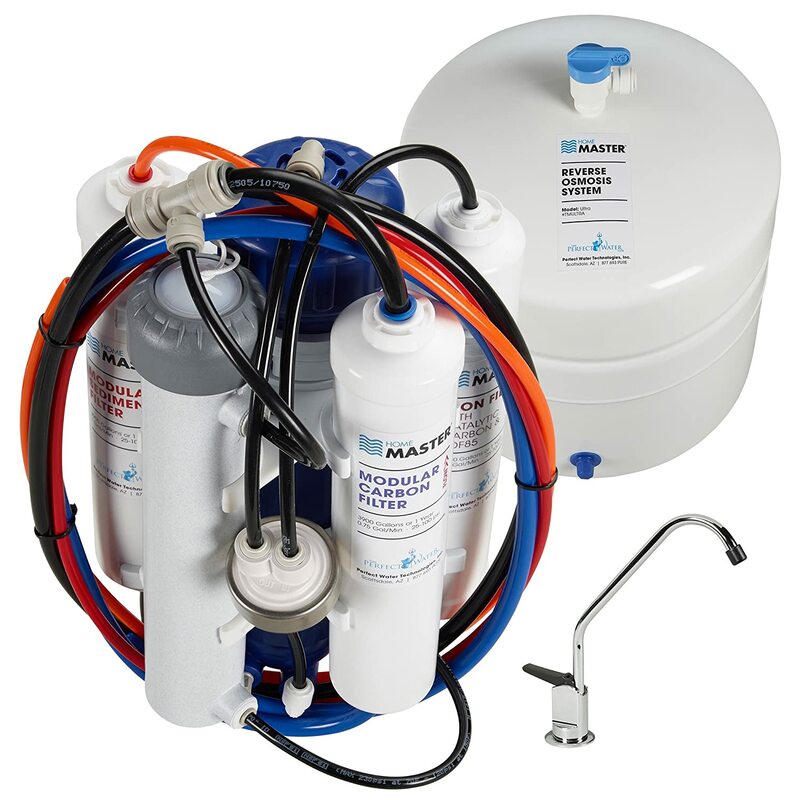 Great at extricating microorganisms from well water, this tough RO system comes with a Fast Flow RO kit that doubles the flow from your tap. Annual filter changes are easy (without the need for extra tools) thanks to one modular assembly. An Audible Alert notifies you to replace the UV filter. Two more benefits for this product are Artisan’s remineralisation process and larger hoses for better flow rate. Home Master TMULTRA Ultra Reverse Osmosis System is an excellent and high rated reverse osmosis system manufactured in a perfect and innovative design offering solutions for the very common contaminations related with the normal reverse filter systems. This wonderful system can be easily installed with very modern filtration methods and purification stages for the removal of ninety eight percent sediments, heavy metals and chemicals. This product is an ideal one for tap as well as well water. Its system has special enduring or easily changeable filters that require proper replacements yearly or after every 2000 gallons. Moreover, the very fast rate of flow is guaranteed. The flow rate is double compared to the common and customary systems. The main features of Home Master TMULTRA Ultra are better innovative design, modern filtration as well as best purification stages, replaceable filters, and more. The dimensions of this product are 20.1 x 16.4 x 12.3 inches. It weighs just 14.2 pounds. The colour of the product is white. It is powered by the corded electricity and has a faucet. Automatic shutoff option is marvellous. The reverse osmosis filtration method and push to connect fitting style is special features. Home Master TMULTRA Ultra has a sleek design with best purification technology that can effectively solve the majority of water contamination issues. It filters well and tap water. Being a highly modern RO, it is never attacked easily by the iron content of water. The unit does not permit the existence of microorganisms in the filtered water. It is installed with a good iron pre-filter with the catalytic C and KDF85 media to remove manganese, iron and hydrogen sulphide. It is well equipped with flexible filters that improve durability along with simple annual system service. The filtration process of this system is very reliable as it eliminates about ninety eight percent of chemicals, heavy metals, dissolved solids and iron via reverse osmosis. The water is then perfectly channelled through the ultraviolet light chamber to remove 99.999 percent of germs. Home Master TMULTRA Ultra is integrated with 6 filtration stages, sterilisation stages and purification stages. It is especially for the generation of very clean and fresh water. The design of the system is incorporated with a good combination of devices that restrict the flow. These devices play a significant role in pressure management in a 50 gpd membrane to lower the making of wastewater. Strong contaminants have the ability to destroy osmosis membrane in case if they aren’t removed. So, it has to be replaced annually. The product has to be properly installed to eliminate the chance of leaking after some weeks of usage. In case, if you fall to follow installation process stepwise will cost the entire system definitely. As per Amazon.com, this product has a rating of 4.8 out of 5 stars! As per best-il, the product bagged 99.3% positive feedback when a survey conducted among 2047 customers on behalf of e-Bay. The RO is ranked among one of the top 10 product currently being sold on the market. It is an awesome RO! It offers high performance and is worth the money spent on it. The product offers you 99.999% contamination free water.